While looking for a budget phone earlier this year, Spice Android One Dream Uno came to my attention. Back in March 2015, this phone was priced Rs 5795. Today it costs Rs 3999. At that time, I wasn't sure if I should pick up this lesser known brand of spice, while there were other contenders from Micromax and Samsung in the budget smart phone market. Another thousand more could have got me a Moto E as well. But based on overall positive reviews, I decided to take a chance and ordered Spice Dream Uno Mi 498. For about a month since it arrived, I didn't use it. Then when I decided to start using it, a major problem arrived- the memory card won't sit properly in its slot and camera won't work. Camera insists that it needs a memory card to operate. No option to set internal memory as default storage for camera. I tried troubleshooting a bit, installed other camera apps, but no luck. Flipkart's return/refund duration had elapsed, so I couldn't send it back. Then one day I took it to Spice Hotspot store on OMR Chennai. Store guy was bit reluctant to help as I didn't buy the phone at his shop. He still checked the phone, fixed the memory card slot and advised that I should reset to factory setting and try again. I did and camera started working fine. Since then, for over 4 months now, phone is running without any problem. I am using it as my secondary phone, mostly for calls. As I am not using it for internet, games etc, battery life is pretty good. Can manage more than 2 days before battery dries out. Android One is a simplified version of Android. So on pressing power button hard, I get only one option to power off. No flight mode, no option to take screenshots. 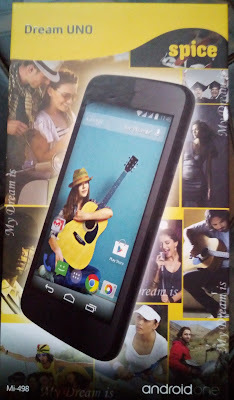 Compared to MotoE, Spice Dream Uno feels a bit heavy. It gets soft back cover which is smooth and comfortable to hold. Battery can be removed. 5MP main camera is decent and almost at par with MotoE(1st gen) and a bit better than Moto E in night conditions. But neither the camera is easiest to use, nor it comes with lots of controls, but photo quality is decent. Sample indoor photo below. Because it was sold on flipkart, this Spice fone came with flipkart app pre-installed. If I try to uninstall it would threaten me saying "removing native applications may cause problems". It does some nautanki when I try to connect it to laptop using USB. Overall, with new low price of Rs 4000, Spice Dream Uno is a nice pick for an ultra budget smart phone with basic usage, rugged usage and decent battery life. 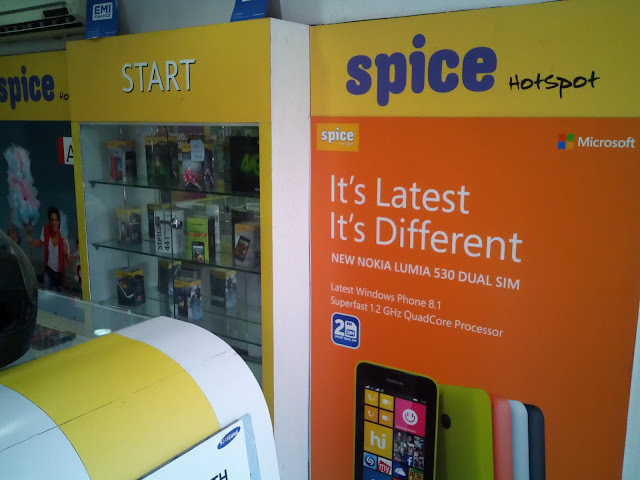 Last Sunday I went to Spice Hotspot store with an idea of buying another unit for a family member. But they didn't have stock of Android one models. Checked few other models- Octa 524, for which Spice Hotspot store was quoting Rs 8200, whereas online price was Rs 6400. I can understand 5% difference, but 20% premium can't be justified. Also store didn't have any display model for us to get first hand feel. We should buy based on specifications and only on payment they will open the box. If that is the case, why not buy online and try our luck, save some money. I bought a Spice phone before sometime and was using it until I realized call quality was very bad outside the house. Also, camera quality suffers in indoor conditions. Otherwise the phone is fine, but now it is only working as a 3g modem for my laptop! I bought a Redmi 2 now and I am very happy with it.